Easter Event 2019 (0.7.2.0) - Announcements - PixelTail Games - Creators of Tower Unite! We have more news with the release of this update. We’ve conducted some research into the PAK format which Unreal Engine allows us to package our game in. In conducting this research, we’ve found that PAK files can significantly reduce the loading times of the game, with some drawbacks we’ll detail below. The PAK file is compressed, which helps reduce the amount of data that is required to be loaded, but comes with a small CPU overhead, which we weren’t able to measure, but it could be an issue if the computer is lower powered. If this sounds fine to you, here’s how you can participate. In your library, right click Tower Unite, and click Properties. Then, click the BETAS tab and select defaultpak. This will start downloading the PAK version of Tower Unite. It seems that Drrabbits dream has come true. Fruit Frenzy is so much better now! This is great stuff. @macdguy Why not PAK common assets into groups instead of one huge PAK? The loading benefits of 50 PAKs wouldn’t be as significant as when it’s all in 1 PAK, but it would still be a huge improvement over 65,000 loose files wouldn’t it? eg content/models/Minigolf has 2000 files for a total size of 150MB, that could be a PAK and if Minigolf updates then you just get that 150MB PAK updated instead of the whole game. While still getting the benefits of not needing to load 2000 loose files. Mac has said this currently isn’t possible with the version of Unreal Engine they are using - and they can’t upgrade right now as it’s a lot of work. 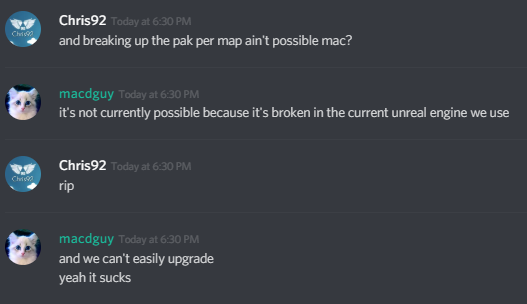 Upgrading the version would result in certain systems being broken (such as workshop) and require them to be rewritten.